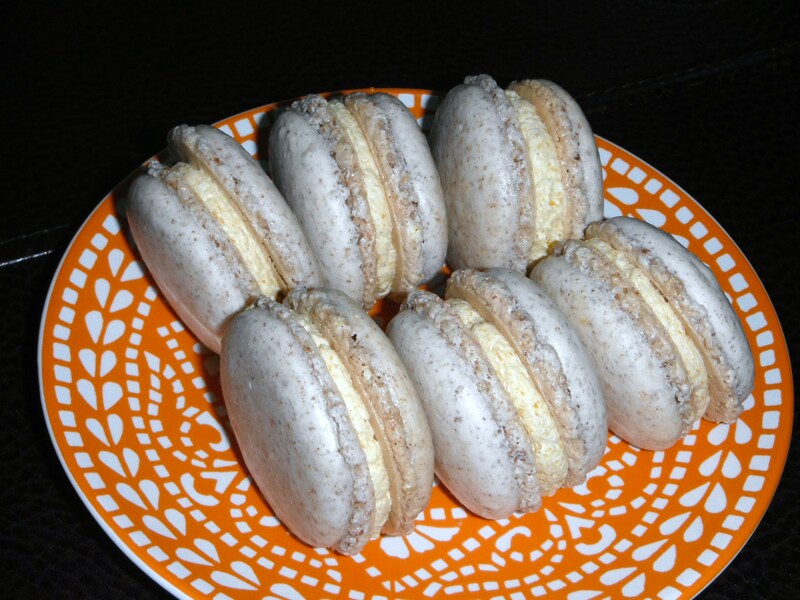 I made some macs using ground pecans instead of almonds and let me tell you, the flavor was amazing. But it wasn't easy! Pecans are a much oilier nut than almonds, plus I have the luxury of being able to buy ground almonds (almond meal) and with pecans, I had to make it myself. Coarsely chop the nuts and place in your food processor. Pulse for 3 second intervals, stopping about every 4 times to scrape the sides of the bowl. This helps to keep the nuts from getting sticky or turning into a paste. Pulse a total of about 20-30 times. (I did 20 and they were starting to turn into a paste, so I stopped.) Don’t wash your food processor bowl, because you are going to use it again soon and you don’t want it to be wet at all. Sift the nuts (if you’d like, my sieve was too fine) onto a parchment paper-lined baking sheet and bake at 200 F for about 30 minutes to dry out. Cool completely, and then combine with powdered sugar and salt in the food processor and pulse to combine. Remove and place in a large bowl and set aside. When the syrup is at 235 F and the whites are at soft peaks, quickly and carefully pour the hot sugar syrup down the side of the bowl into the whipping egg whites. I’ve also written before that you can turn the mixer off, dump the syrup in and immediately begin whipping again at high speed. Doesn’t matter which way you do it, but you want to be quick to avoid cooking the egg whites and be careful not to let hot syrup hit the moving whisk so that it doesn’t go everywhere! Whip the meringue until it cools slightly and is glossy and stiff. 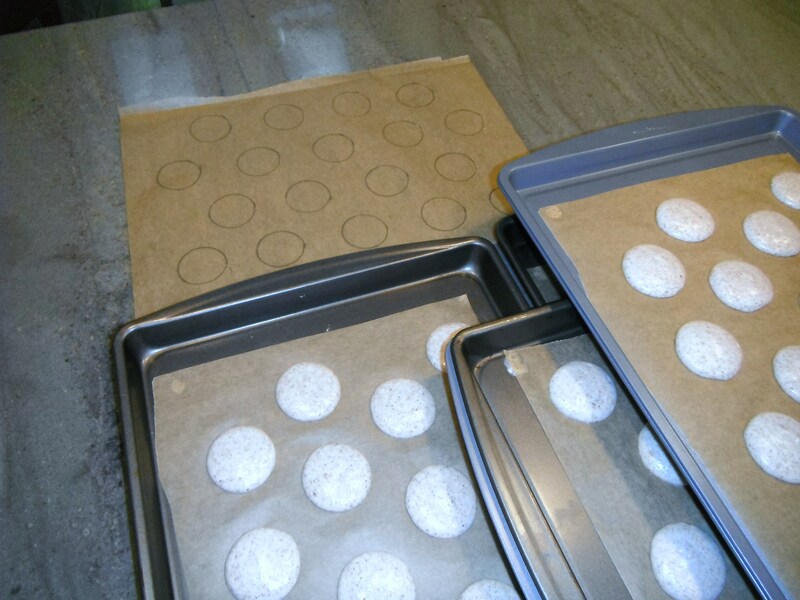 Spoon the meringue into the center of the dry ingredients and fold to incorporate. Remember that the final product should look like hot, flowing magma! Don’t forget to double-stack your baking pans. If you’ve read previous posts, you know I’ve had success baking in my oven at 325 F for about 14 minutes. The author of this recipe, however, recommends baking at 200 F for 15 minutes then increasing the temperature to 350 F and bake another 9 minutes. So, I tried it. There could not be a better way to know that each person needs to get to know their own oven when baking macs! 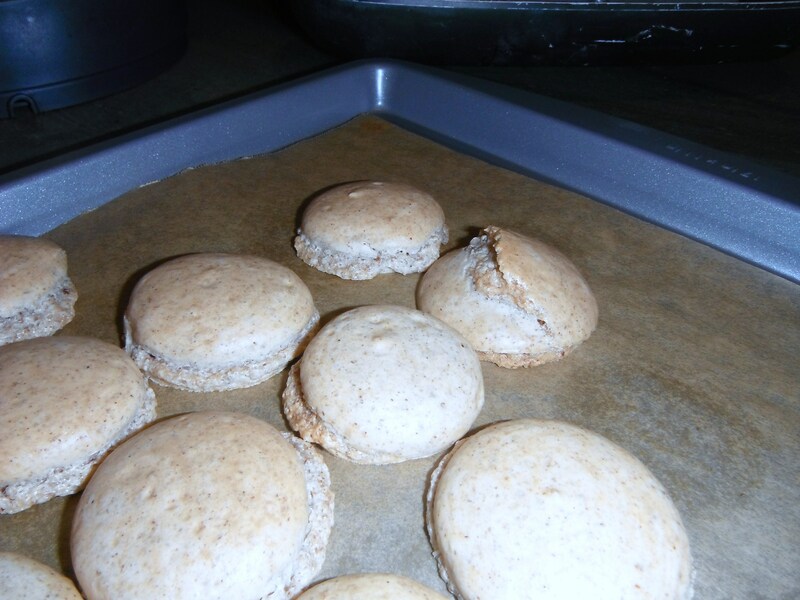 After 10 minutes or so at the low temperature, my macarons were exploding in the oven, although I did notice a foot. I immediately turned the oven up to 350 F and attempted to correct the process by increasing the heat. Although the first batch of macs tasted great, they weren’t very pretty. I baked a second batch, for 14 minutes at 325 F and they came out beautifully! This recipe calls for the addition of cream of tartar, an ingredient I haven’t used previously in my mac recipes (although I am very familiar with its use in meringues). Cream of tartar is known chemically as postassium bitartrate. It serves to stabilize egg whites and allows them better tolerance of higher temperatures, as well as bigger volume. Whip with whisk until emulsified. If the mixture appears grainy and not smooth, it’s not yet emulsified. Often, you can get it there by turning up the speed of the mixer or by slightly warming the bottom of your mixing bowl. If those things don’t work, you can always add more butter, 1 T at a time. Looks gorgeous! I love macarons!! !